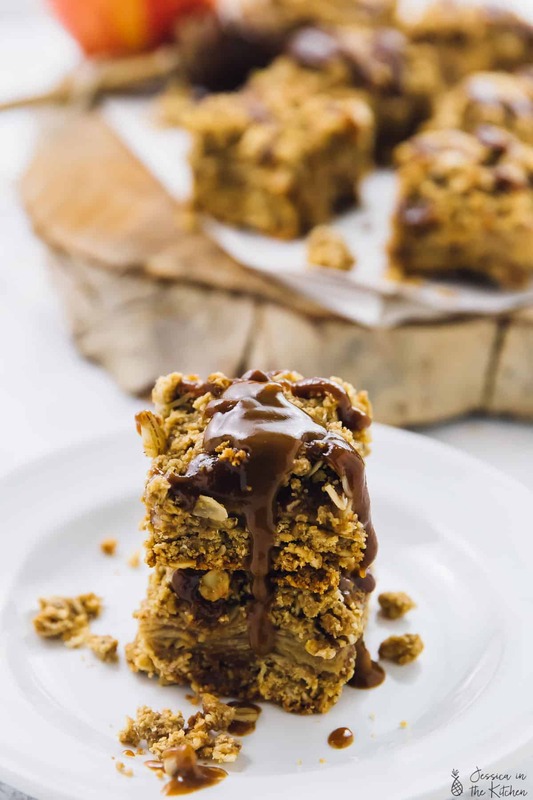 These Vegan Apple Pie Bars are absolutely decadent! They’re drizzled with homemade salted caramel, topped with a divine crumb topping and are gluten free! Oh, just look at that drizzle. 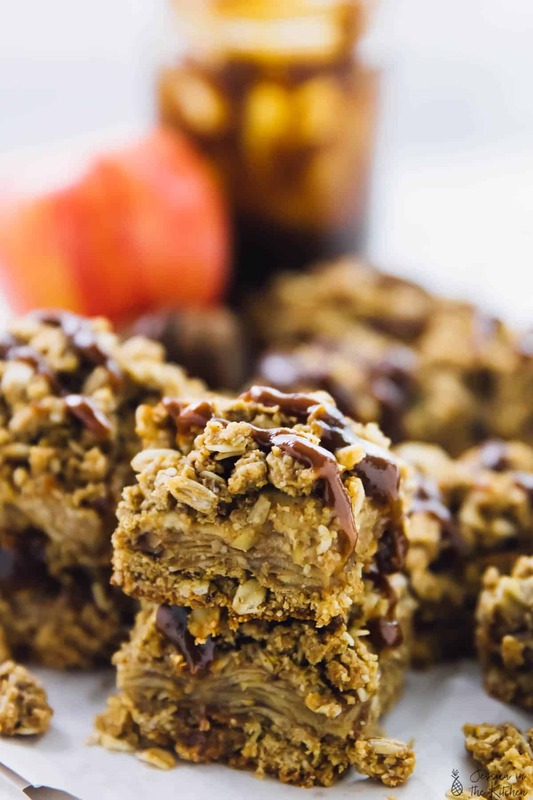 If you’re wondering just how good these Vegan Apple Pie Bars are, they’re a straight 10/10. Oh, and that’s before you even put the caramel sauce on them. These bars are my favourite take on apple pie. 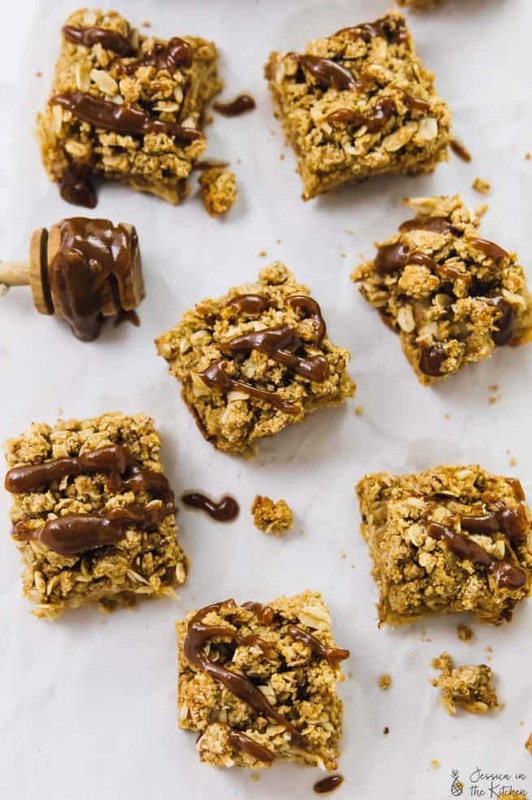 Whether you’re getting into the fall mode, looking for a Thanksgiving dessert or just making dessert for your friends/Netflix binge night, these bars are a total treat worth every bite. The other night, during another Drop Dead Diva Netflix binge, I made a makeshift apple crisp. I had some amazing granola, and sautéed an apple in a pan with some vegan butter, coconut sugar, and cinnamon. I sautéed the slices until completely soft, then topped with them some of the granola, and leftover ice cream in the fridge. Needless to say, this was a complete win. They also were the inspiration for these bars. I do plan to make an apple crisp for you one day soon by the way, but these bars couldn’t wait. Let me tell you about these bars. One, you need to make them. They make look complicated, but they’re pretty simple. You make one crumble, then press it into the bottom to make the crust for the bars. Top with the apples, then the rest of the crumble. 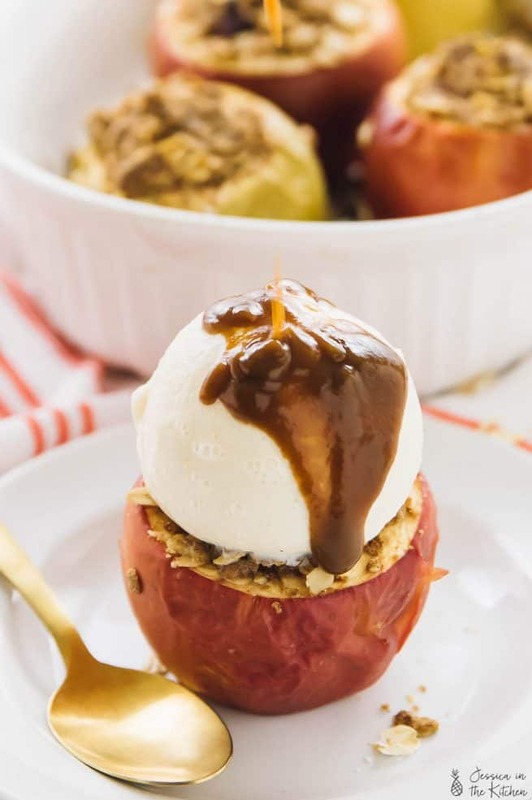 Bake, cool, drizzle with vegan caramel sauce. They are easy, so decadent, and an absolutely dream come true. They’re so easy to serve, and even easier to devour. 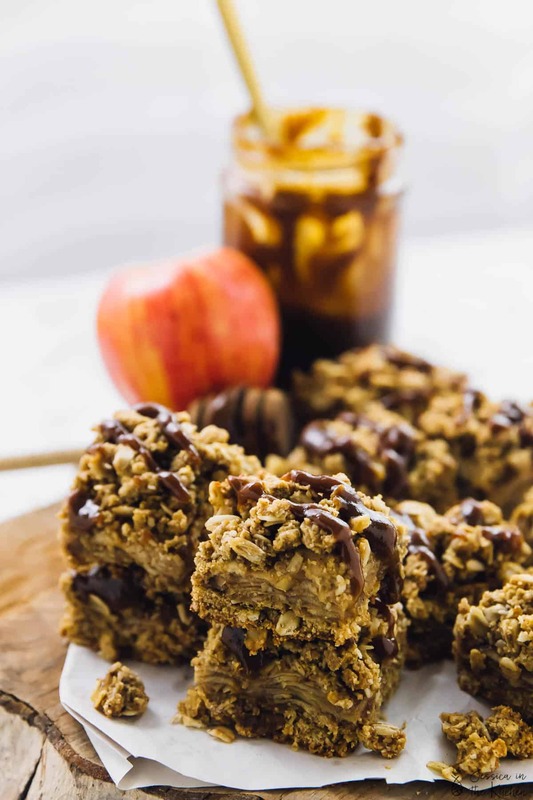 I already had my vegan caramel sauce made and in the fridge from when I made my Baked Apples, and I knew I needed to top these bars with that sauce. These bars definitely remind me of bites of apple pie. I love how the apples soften up because of baking, and how these bars taste fantastic either cold, warm or at room temperature. 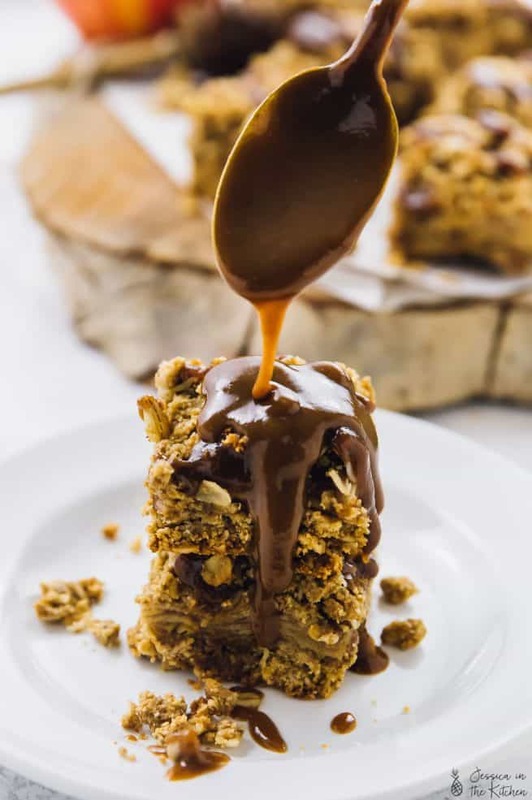 While they’re divine on their own, my salted caramel sauce goes perfectly on these bars. The recipe makes more than you need, but trust me, it is so worth it. It also lasts for like ever in your fridge, so you can put it in and on every single dessert. Or breakfast, no judging you. Enjoy! You deserve it. 1. Preheat oven to 350° F/ 177° C. Prepare an 8x8 baking dish by lining with parchment paper or with foil. Set aside. 1. Mix all the ingredients together and set aside. 1. In a bowl, mix all dry ingredients with a wooden spoon. Add the coconut sugar, the maple syrup, the sea salt, coconut oil and flax egg, and vanilla extract and mix until all combined throughly, about two minutes. 2. Split the crumble mixture in half. Press the first half of the crumble mixture evenly into the bottom of the dish to form a crust. Bake for 10 minutes in the oven. Remove the warm baked crust and top with the apple filling, evenly covering the crust in a neat layer. Add the other half of the crumb topping, pressing it slightly together. 3. Bake for 25 minutes until golden and puffy. 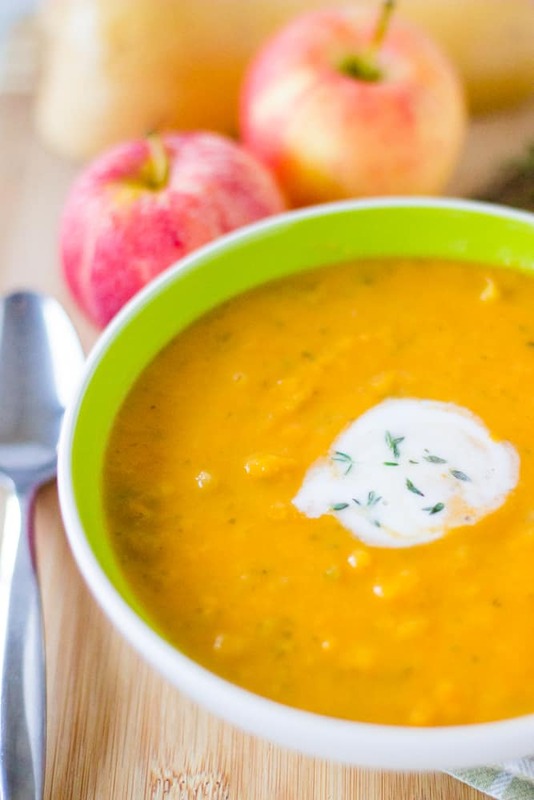 Allow to cool for 20 minutes, then completely in the refrigerator for at least an hour. 4. Slice into 12 or 16 bars and enjoy! Drizzle caramel sauce on each slice when serving. You can serve them cold, warm or at room temperature. Enjoy!! Follow the directions for the vegan caramel sauce. Drizzle over the bars. The sauce makes a lot more than needed for the recipe so you can keep the rest in the fridge and drizzle it over everything! 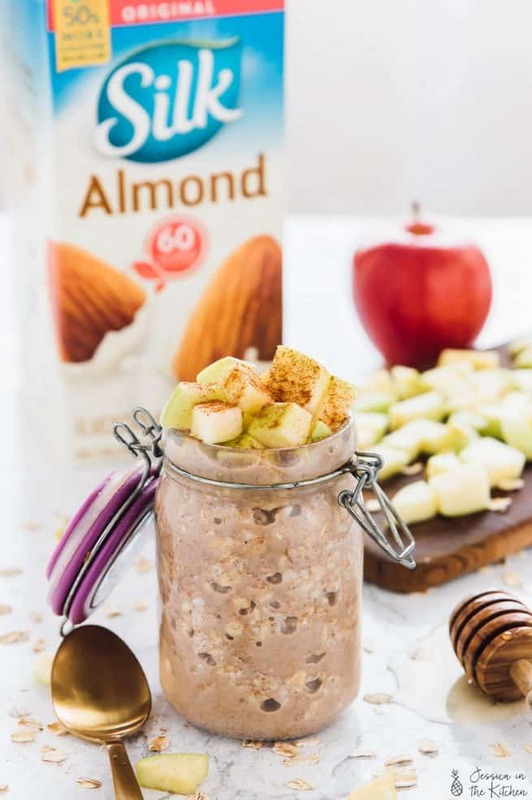 My favourite apples for these bars are Honeycrisp and Granny Smith. The Granny Smith adds a delicious touch of tartness if you’re looking for some contrast in this recipe. They remind me of my favourite oatmeal bars, only richer and better because of salted caramel…absolutely irresistible!